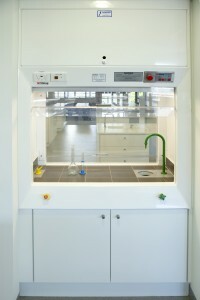 What is a Fume Cupboard? 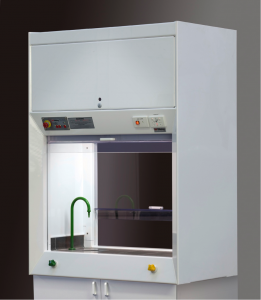 Each Viking Plastics’ fume cupboard is renowned for its superior workmanship and quality materials. They are constructed in accordance with Australian Standard AS/NZS 2243.8:2014 to provide a safe working environment. Used in laboratories, class rooms and industry, a fume cupboard is in effect a ventilated box with a counterbalanced, vertically sliding, clear sash (door) on one side (the front) designed to protect the user from inhaling toxic fumes when working with dangerous chemicals. 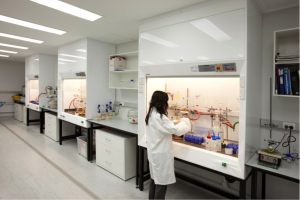 The chemical fumes are extracted from the cupboard via a chemical resistant fume exhaust fan and plastic ducting and safely expelled to atmosphere. Viking Plastics supplies both single-sided and double-sided fume cupboards. A double sided fume cupboard has two vertically sliding sashes (doors) – positioned on opposite sides of the cupboard. The main body is fabricated from welded unplasticised Polyvinyl Chloride (uPVC) to deliver a clean cut, neat appearance. uPVC is one of the best materials for use in highly corrosive environments, involving exposure to a wide range of acids, alkalis, oils, salt solutions and volatile fumes. uPVC retains its smooth gloss surface permanently, even in the presence of gases and chemicals. It is hard to ignite and will not support combustion once the source of ignition is removed. Viking Plastics’ fume cupboards are equipped with control valves mounted on the front panel for services such as gas and water. The workbench is finished in hard-wearing, acid resistant ceramic tiles with rounded corners to facilitate easy cleaning. The standard units come fitted with a sink, dual GPO with residual-current device (RCD) protection, internal lighting, and a comprehensive control system. The control system controls the gas, power, light and fume extraction fan (with automatic pre-purge and post purge periods) as well as providing operating status and visual and audible alarms. Viking Plastics’ fume cupboards can be custom built with a different selection of fittings to suit your individual requirements. Goose neck taps supply water (hot, cold or mixed). 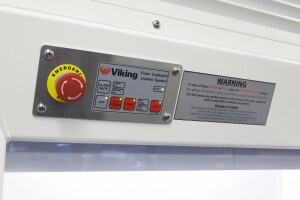 Emergency stop button (manual reset type) immediately disconnects the electrical power and gas to the fume cupboard while allowing the exhaust fan to continue operating to ensure the fume cupboard is completely purged of fumes. Fitted with a door alarm to ensure only one door is open at any one time to prevent cross-draughts.